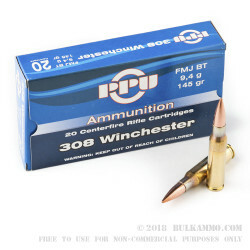 A bargain on the very potent match offering from Prvi Partizan in .308 Winchester. The 145 grain full metal jacket boat tail projectile is a perfect fit for general range and plinking use and is also accurate enough to be used for hunting (where applicable with a lead based FMJ bullet) and target shooting. This has a consistent accuracy of sub 1.5MOA or thereabout and offers a significant discount to other rounds of this quality. 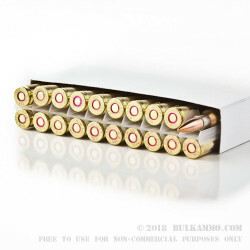 The top tier brass is also a nice perk considering the lower price point to get into the shooting of this ammunition from the Serbian maker. 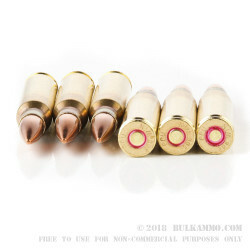 The annealed brass with Boxer primer offers a flexible, easy to reload and resize cartridge casing that provides an excellent donor from a very discounted round. It’s the best of both worlds because the brass you are getting after being once fired is premium. The reliability has been proven time and again for Prvi Partizan and most U.S. shooters don’t have anything negative to say about the company or the quality of manufacture. 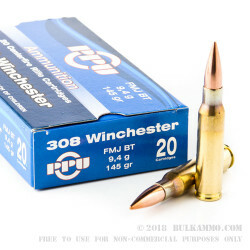 You can rest assured you will get the functional reliability you need in any mainstream production .308 Winchester rifle if it is well maintained and clean. From ignition to feeding to extraction, Priv Partizan is great quality ammunition.